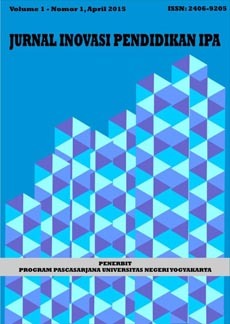 Jurnal Inovasi Pendidikan IPA (JIPI) is a scientific journal published by the Graduate School of Universitas Negeri Yogyakarta. The journal disseminates papers written based on the results of study and review of literature in the sphere of natural sciences education, biology education, physics education, and chemistry education in primary, secondary, and higher education. Jurnal Inovasi Pendidikan IPA publishes its issues biannually, in April and October. This journal has been ACCREDITED by National Journal Accreditation (ARJUNA) Managed by Ministry of Research, Technology, and Higher Education, Republic Indonesia with Second Grade (Peringkat 2, Sinta 2) since year 2016 to 2020 according to the decree No. 21/E/KPT/2018. Research Trends of Scientific Literacy in Indonesia: Where We Are?